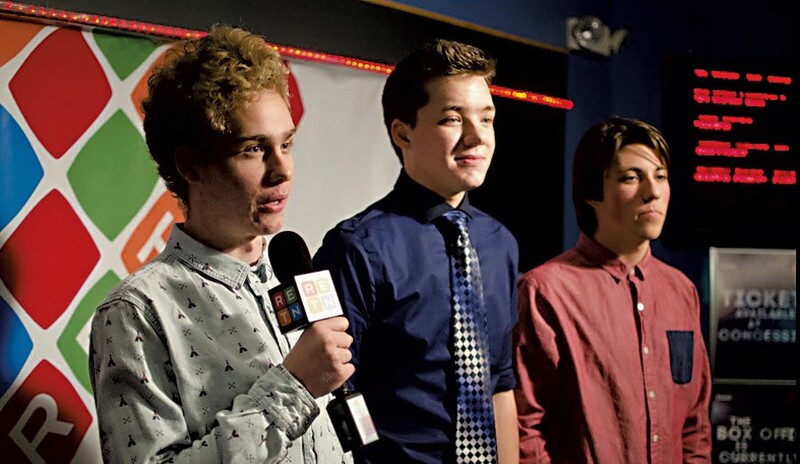 Student Film Contest Premiers at the Roxy | The Kids Beat | Kids VT - small people, big ideas! Kayhl Cooper, Connor Geer and Adam Turner took home an award last year for Best Cinematography. Quick, come up with a spy story featuring the following: a character who dies shortly after being introduced, a black-and-white photo of Ian McKellen, and the line, "Not since the accident..." Those were the prompts for this fall's 50-hour student film contest, a twice-yearly competition for middle and high school students from Vermont and New York. Teams had one weekend in which to write, shoot and edit a short movie including those details. "It was certainly a challenge," says event organizer Nick Gordon, who participated in the contest when he was a student at Essex High School several years ago. "It's very difficult to pull off a short film, but it's rewarding. If you have the chance to see your film in a movie theater, that's pretty cool."